There’s a new digital-download content provider in town. The BBC Store promises to make the “unmissable” “ownable”. It’s Aunty’s version of iTunes, featuring only BBC programmes. But is it all that? 1. DRM means you may lose what you buy. You can only use BBC-provided software to play your purchase. What this means is that if your hard disk fails (for example) and you want to download it again and the Store has removed it in the meantime, you can’t. You can’t even back-up your purchase. Actually, Aunty, it is possible; you just don’t want your customers to do it. Uh-huh. You make the content. If a brilliant company like gog.com can make DRM-free content re-downloadable forever (even after they lose the rights to sell some of it) then why can’t you? 2. Where are the extras? Whereas DVDs have director commentaries, featurettes and other bonus content, the BBC Store seems devoid of any such perks – or, at the very least, I’ve not seen them listed. 3. I’m a geek! Is it SD or HD? We’re not told, either way, for any particular programme. There are no previews, no review feature, no way to know what the quality will be like. Buy and try, if you dare. 4. Content will (probably) be of worse quality than the equivalent DVD/Blu. While modern encoding is much more efficient than DVDs’, a DVD has a potential bitrate of 11Mbps, almost four times more than BBC Store’s. Blu rays, meanwhile, are 1920×1080, or 1080p, with a bitrate of 20Mbps for h.264, and often feature lossless audio. 5. Material has been edited. Somewhere. So says Help & Support. What they don’t care to say is which shows in particular have been edited. Another case of buyer beware. 6. The prices are too high. Way too high. Seriously, they are. If you compare to the equivalent DVD/Blu-Ray, the BBC Store is much more expensive for what it provides. Luther, series 1-3: Amazon: 10 pounds. BBC Store: 15 pounds. Sherlock, series 1 & 2: Amazon: 8 pounds. BBC Store: 16 pounds. The Good Life, complete: Amazon: 17 pounds. BBC Store: 36 pounds. Which was the format with the better quality and extras again…? 7. You can’t return purchases once you’ve seen them. * unless the issue is technical. 8. You can’t sell on. If you decide you don’t like your DVD, you can always sell it on and make some money back. With the BBC Store you have no such recourse. Forget about leaving someone your hard-bought collection in your will! 9. You can’t lend a programme to a mate. Unless, I suppose, you lend them your iPhone or login details. Lending a DVD is just a tad safer. Seriously? They launch a store without such a feature? If you don’t have a memory palace, you’re out of luck – and BBCWW are without some sales. 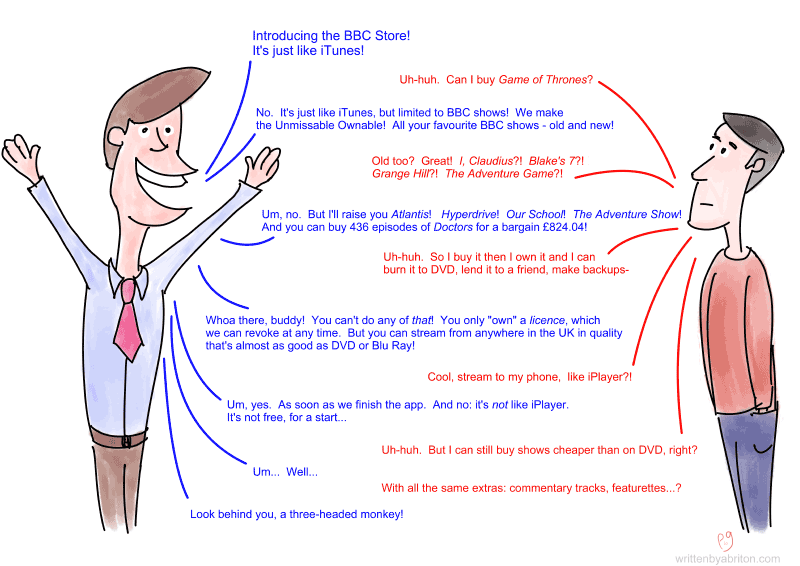 The BBC Store is a creation of BBC Worldwide, but only people living in the UK can buy from it! What about ex-pats (like me)? Surely BBCWW can open it up to everyone? If it’s a matter of territorial licensing, that surely does not apply to all of their archive? 12. It’s not that portable. If you ever move away from the UK (or go on holiday), you can no longer stream your purchases while abroad. If you need to re-download something from your new home in Mexico, you’re also out of luck. Compare this to popping a DVD in your luggage. 1. There’s material on sale which you can’t buy on DVD. Either the DVD is out of print (cf. Maid Marian and Her Merry Men) or just never been issued in the UK (cf. the Tom Baker Hound of the Baskervilles), there’s bound to be something there that will tempt you. And that will be more and more the case as the Store unearths and unlocks older content from their archives. From my perspective, I’d much rather have the DVD/Blu, but I can well understand the Beeb not wanting to commit to releasing the complete Bargain Hunt on disc. Yet, even that show must have its fans, so bully for them that they can live in (Expensive) Daytime TV Heaven if they want to. 2. New material can be released on short notice. You don’t have to wait for the boxed set: buy the season pass and download new episodes as they appear. You don’t even have to wait for the post. You don’t have to buy the bundle. For example, the BBC’s recent release of the old Doctor Who adventure, The Underwater Menace. This is a four-part story which unfortunately is missing the video of parts 1 & 4. Those two parts were reconstructed (apparently at minimum cost and effort) from a very limited number of stills and the original audio. I would not pay tuppence for either of them, judging from their previews on iTunes. Part 3 was also available on another DVD, Lost in Time. The recently recovered-and-restored part 2, on the other hand, can now be bought on the Store for 2.99 – which is probably the most expensive 24 minutes of anything there – but still (currently) cheaper than shelling out for the whole DVD. The new generation of kids (and some adults) seem to like their virtual shelves. No physical product to store. Portability & convenience! * provided you have a reliable hard disk, a solid Internet connection, and nobody hacks your account or steals your laptop! 5. You can brag to your ex-pat friends that you have access to something they don’t! Go DRM-free. Be brave. Trust that your customers aren’t thieves. Let them download to Linux if they want to. Let them play video via their Raspberry Pis. Do for video sales what mp3 did for audio. Look at how much the DVD for a series is selling on Amazon, and – at least – match it. Don’t charge more for an inferior product with worse picture/sound and fewer/no extras. Charge less for a superior one. Because can’t you afford to that by cutting out the middle man? The Store’s soft-launch content is good for recent programmes but where’s all the great stuff from the 1960s and 70s? The content people will want most of all is what they can’t obtain on DVD. The Store definitely needs some sort of subscription model for shows like Bargain Hunt, which would cost a small fortune to collect for their fans. Rentals as well as sales. Amazon manages it. Open up your content to the rest of the world. Or, at the very least, put your not-on-dvd exclusives on iTunes for the rest of us. Quite frankly, I’d much rather give you my money than Apple. We need more product information on the pages. Whether a show has been edited. Is it 4:3 or 16:9? Is it mono or stereo? Has it been remastered? Preview clips are a must. Ability to add to a wish list. Customer Reviews.